Illuminate your room with a fairy lantern! 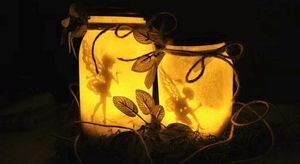 Using jars, flameless tealight candles, and fairy silhouettes, we can make enchanting fairy lanterns to decorate our homes and bring a little spring magic indoors. Ages 8 and up. Materials are limited, so registration is required.